Our editor's choice 2-in-1, the HP Spectre x360, is better for just $170 more. The Asus ZenBook Flip 14 comes etched with hairline concentric circles on the lid, a stylish touch that's not overly prone to fingerprints. Framed on the left and right sides by svelte 7.15mm bezels (the top and bottom bezels are considerably thicker), the ZenBook Flip 14’s touch-enabled, 14-inch 1920-by-1080 display looks about as sharp and vivid as you’d expect. Measuring about 280 nits (or candelas), the Flip 14’s display is reasonably bright and well above our 250-nit standard for comfortable indoor brightness, although shy of the 300-ish nit levels we prefer. The ZenBook Flip 14's 1920-by-1080 touch display boasts slim 7.15mm bezels along the left and right sides. Viewing angles on the Flip 14’s AHVA screen (a proprietary variant of IPS) are impressive, with the screen dimming only slightly when viewed from the sides, top or bottom, with no evidence of inverse colors at extreme viewing angles. I had an easy time tapping and swiping on the Flip 14’s touch display, and yes, pen support is included, provided you supply your own pen. Asus sells an optional active pen for $50. Asus appears to have used the same backlit keyboard on the Flip 14 as it did on the recent ZenBook 13, and that’s a good thing. The Flip’s snappy keyboard boasts square, slightly concave keys that give you a satisfyingly tactile bump when struck, with plenty of travel in the bargain. The lack of a numeric keypad leaves plenty of room for the main keyboard, making for easy discovery and few if any mistaken keystrokes. 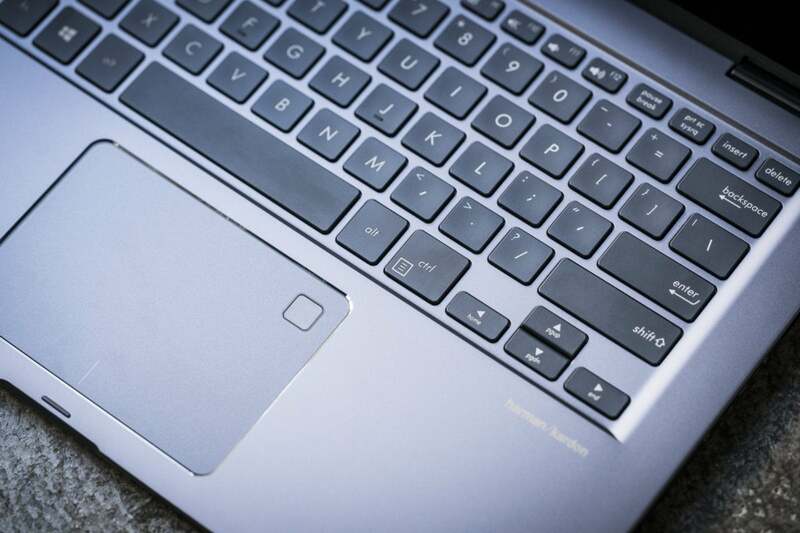 The ZenBook Flip 14's snappy keyboard is a pleasure to type on, but its finicky fingerprint reader gave us trouble. Back on the plus side, the Flip 14’s Harman Kardon-designed speakers sound considerably better than those of your average laptop, with reasonably rich mid-range detail and even a hint of bass. I was able to crank Paul McCartney & Wings’ “Live and Let Die” without any noticeable distortion, while Mozart’s 26th Symphony sounded good enough that I kept listening after finishing my speaker testing—high praise when it comes to the typically tinny universe of laptops speakers. Video images from the ZenBook Flip 14’s 720p webcam look relatively sharp, a bit grainy but still perfectly adequate for Skype chat. The Flip 14’s selection of ports is pretty much what you’d expect from a sub-$1,000 2-in-1 ultraportable. 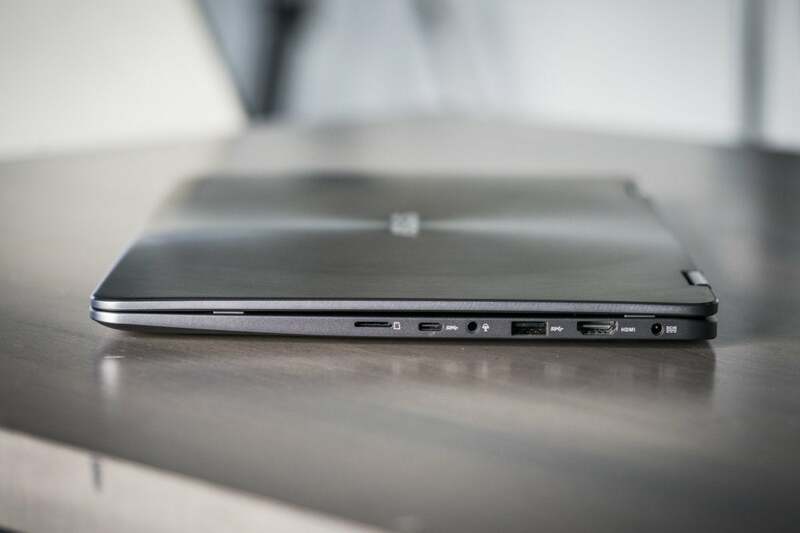 On the left side of the laptop, you’ll find a single USB 3.0 Type A port, which sits sandwiched between a two-and-a-half inch air vent and the volume and power buttons. The left side of the ZenBook Flip 14 features a USB 3.1 Type A port, plus a large air vent. On the right side, we’ve got a barrel-style charging port, a full HDMI port, a second USB 3.0 Type A port, a combo audio jack, a USB 3.1 Gen 1 Type C port (up to 5Gbps), and a Micro USB card reader. Right-side ports on the Flip 14 include a full HDMI port, USB 3.0 Type A, USB 3.1 Gen 1 Type C, a combo audio jack and a Micro SD memory card slot. 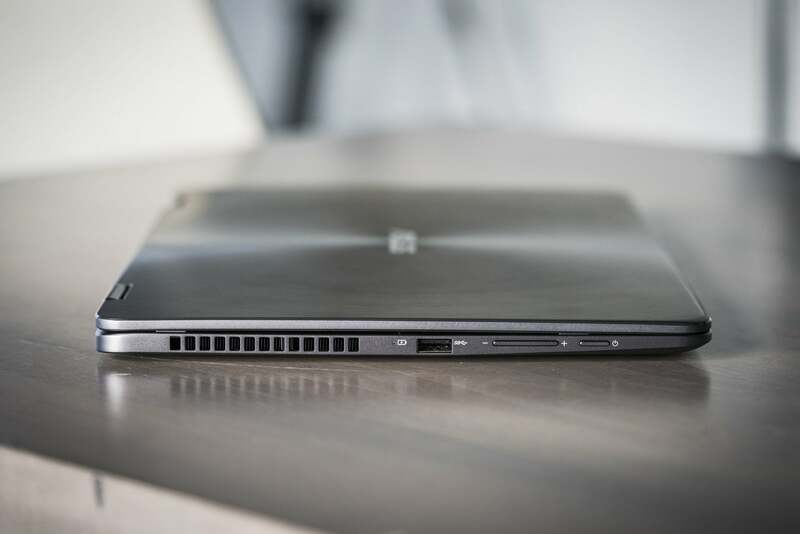 All in all, not bad, but the lack of Thunderbolt 3 ports is a disappointment, particularly given that the $1,000 HP Spectre X360, our current favorite 2-in-1, manages to squeeze in two of them. Armed with a quad-core i5-8250U processor from Intel’s current 8th generation of CPUs, the reasonably fast ZenBook Flip 14 doesn't harbor any surprises in the performance department. Peppy without breaking records, heat-conscious without playing it too safe, the Flip 14 sticks with the 8th-gen pack without ever quite leading it. Only in the battery-life department were we wishing for more. First, we ran the Flip 14 through its paces with PCMark 8 Work Conventional, a benchmark that simulates run-of-the-mill PC tasks like web browsing, word processing, video chatting and spreadsheet building. The ZenBook Flip 14's solid PCMark 8 Work Conventional score means you can expect smooth-as-silk Office performance. Unsurprisingly, the Flip 14 and its quad-core 8th-gen Intel CPU passed the test with ease, easily clearing our low-water mark of 2,000 for smooth performance of day-to-day laptop chores. In other words, you can expect the Flip 14 to run Office and its ilk without skipping a beat, although the same can often be said for cheaper dual-core systems. 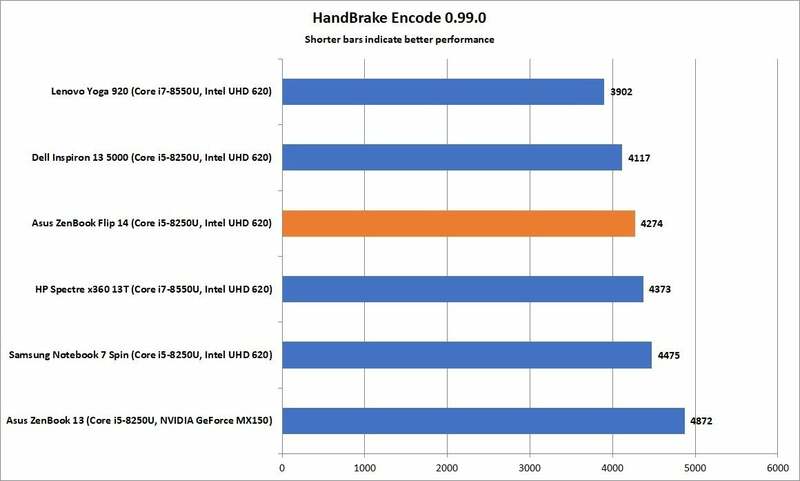 Running Office is one thing, but encoding large video files is quite another, which is why we use the free Handbrake video conversion tool to see how laptops balance performance and heat management under a crushing CPU load. The ZenBook Flip 14's CPU-intensive Handbrake score holds up nicely compared to its quad-core competitors. Compared to other recent 8th-gen quad-core laptops we’ve tested, the ZenBook 14 lands in the middle of the pack, slightly behind the speedy Lenovo Yoga 920 (a pricey 2-in-1 convertible that benefits from a beefier i7-8550U processor) but ahead of the somewhat slower ZenBook 13 (which has the same i5-8250U processor as the Flip 14 but in a smaller, slimmer chassis). So while it didn’t win the gold in our Handbrake test, the Flip 14 came in a strong third, an impressive showing for a $900 convertible. 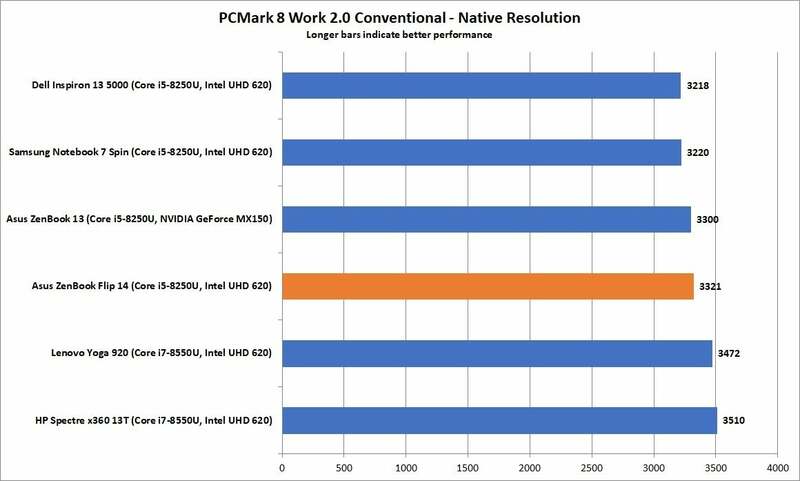 Yet another CPU-intensive test, our Cinebench benchmark pushes laptop processors to the limit as they render 3D images in real time. While Handbrake tells us how a given CPU deals with stress over the course of an hour or so, the Cinebench test is over in a matter of minutes, making it more of a sprint than a marathon. Landing near the rear of its 8th-gen quad-core competition in terms of our Cinebench test, the Flip 14 appears to lack the bursty speed enjoyed by some of its peers. This time, the Flip 14 slides into second-to-last place, while its little cousin, the ZenBook 13, vaults into a virtual tie for first. 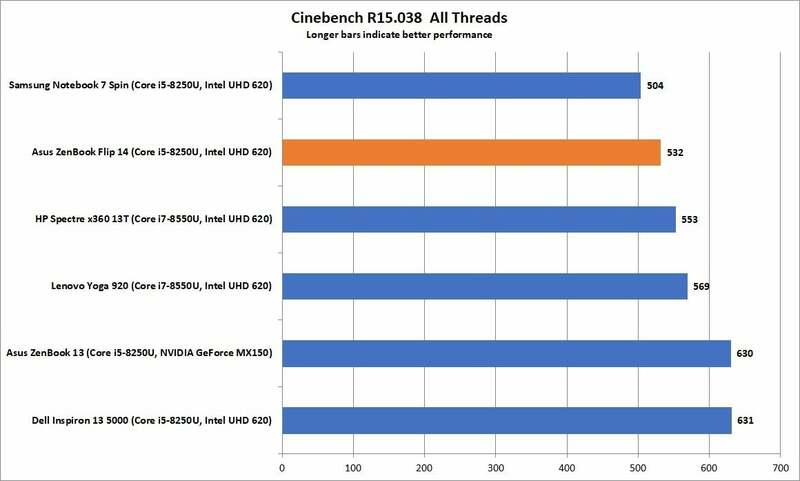 To be fair, the Flip 14's next-to-last Cinebench score isn't necessarily a bad performance, considering the heady competition, but it does tell us that the heat-conscious Flip lacks the kind of bursty speed possessed by the ZenBook 13 and its counterparts. We also tested the Flip 14’s single-core Cinebench performance, and its results were expectedly middling, mirroring what we’ve seen from other quad-core and even dual-core systems. Only one of the 8th-gen laptops in our 3DMark Sky Diver comparison chart boasts a discrete graphics core, and (spoiler alert!) it’s not the ZenBook Flip 14. 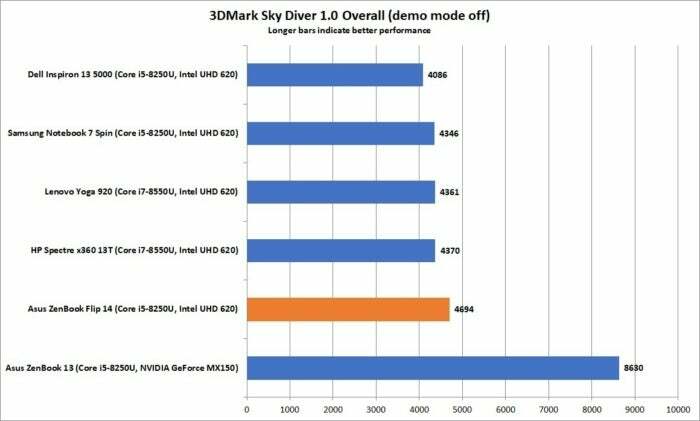 The ZenBook Flip 14's middling 3DMark Sky Diver score is no surprise given its integrated graphics core. Back in the rear with all the other systems with integrated Intel 620 UHD graphics, the Flip 14’s “best of the worst” score doesn’t mean it can play Battlefield 1 appreciably better than the others. Instead, expect the Flip 14 and its similarly equipped competitors to do an OK job of handing everyday graphical duties with a little casual gaming on the side. 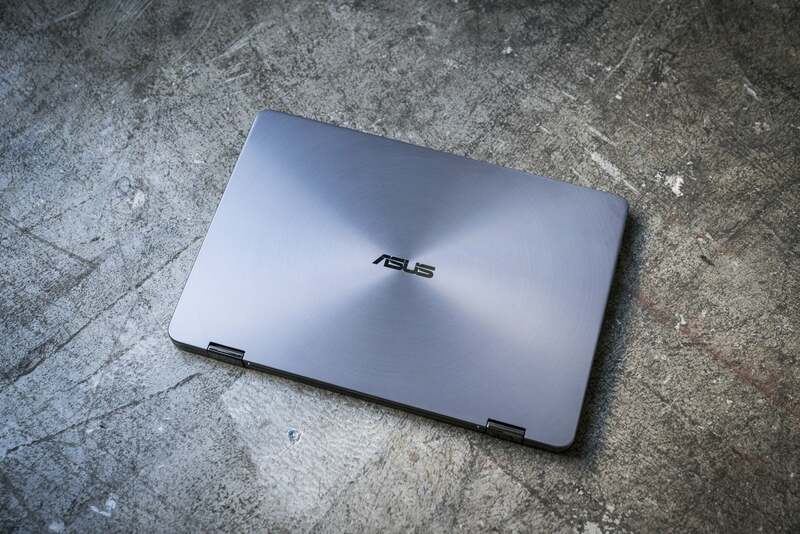 If you’d like to squeeze more gaming prowess out of the Flip 14, you can always pony up $400 extra for a model with Nvidia GeForce MX150 discrete graphics, mirroring the hardware inside the ZenBook 13. 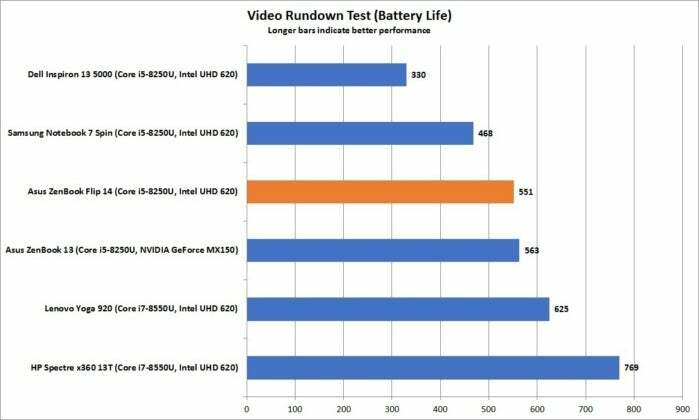 We test laptop battery life by looping a 4K video using the stock Windows 10 Movie and TV player, with screen brightness set between 250-260 nits (or about 90 percent on the ZenBook Flip 14) and with the volume set to 50 percent and headphones plugged in. While the Flip 14's battery-drain result is relatively good, we were expecting more considerning the system's battery capacity. The Flip 14’s more than nine hours of battery life is certainly respectable; indeed, I was able to use the Flip for most of a workday without plugging in its AC adapter. That said, we were hoping for more given the laptop’s relatively roomy 57Whr battery. For example, the ZenBook 13 and its smaller 50Whr battery basically scored the same result in our battery drain test, while the runaway winner, the HP Spectre x360, managed to wring more than three hours of additional battery life from an only slightly larger 61Whr battery. 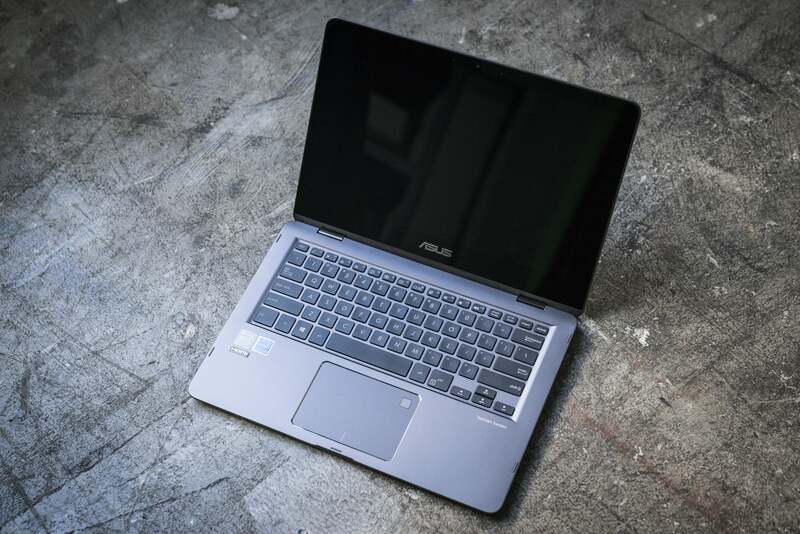 With its peppy performance, sleek design, sharp display and comfy keyboard, the $900 Asus ZenBook Flip 14 makes for a solid entry in the current crop of 8th-generation Intel-powered 2-in-1 convertibles, but you can do better for just a hundred bucks more.